Rising to elevations between 13,000ft/4,000m and 21,000ft/6,500m, western Bolivia’s massive glaciated peaks and the surrounding altiplano (high plains) feature cobalt-blue skies and remarkably stable weather. These high peaks provide superb and seemingly endless opportunities for alpinists and hikers. The culture of Bolivia is fascinating. 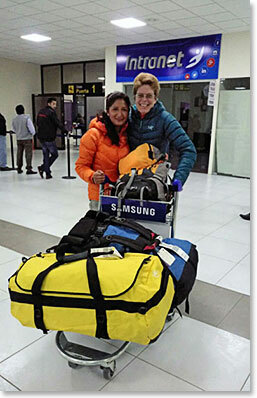 Many Aymara and Quechua people living in remote areas still do not speak Spanish. Yet in La Paz, there is a colorful mix of modern and traditional, European and ancient Andean cultures. Huayna Potosi (19,973ft/6088m) is a classic, challenging climb in Bolivia. It is huge, wild, but also accessible. 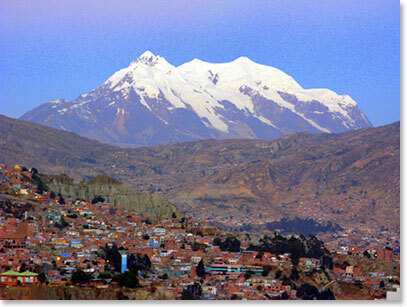 Illimani ( 1,125ft/6,439m) the highest and southernmost peak in the Cordillera. The glaciation measures 5m/8km from one end to the other. It is one of the most beautiful and impressive mountains in South America. Follow Chris on her daily dispatches of her journey.